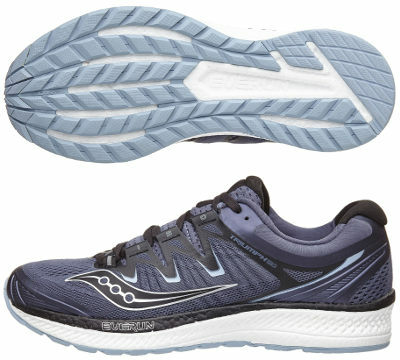 Saucony Triumph ISO 4 are neutral cushioned running shoes. The long awaited Saucony Triumph ISO 4 completes all efforts from american brand to successfully join refurbished technology ISOFIT finally integrated within upper and latest developments in flagship material EVERUN into a premium running shoe. The winning formula was unveiled first in striking Freedom ISO which already integrated ISOFIT system in upper (no longer as external, stiff cage) and featured a full-length EVERUN only midsole, something that has been slightly adopted by other high price models from Saucony. There are many changes compared to its predecessor Triumph ISO 3 and most visible one is the more integrated ISOFIT system which is no longer an external and intrusive cage but part of the upper offering secure fit and improved flexibility. Multilayer engineered mesh allows great ventilation with soft feel and heel counter has been redesigned to provide more stability. Molded foam collar is made of RUNDRY™ fabric for great breathability and odour control resulting in optimal sanitation and with increased thickness reduces gap around the heel keeping eveything in place. The other major change in Triumph ISO 4 is that midsole is enterely made of full-length EVERUN and not only crash pad like in past edition. Although there is also an EVERUN topsole for a more responsive ride, there is no change in expected 8 mm drop. It seems that Saucony is in the right path to fight against Boost™ from Adidas even if progressive pronation support like in Liberty ISO is not 100% EVERUN. Outsole has been redesigned as well keeping both TRI-FLEX configuration and well-known rubbers (iBR+ and XT-900 depending on the area) but with new grooves in the forefoot which allow limited expanding for better ground adaptation.